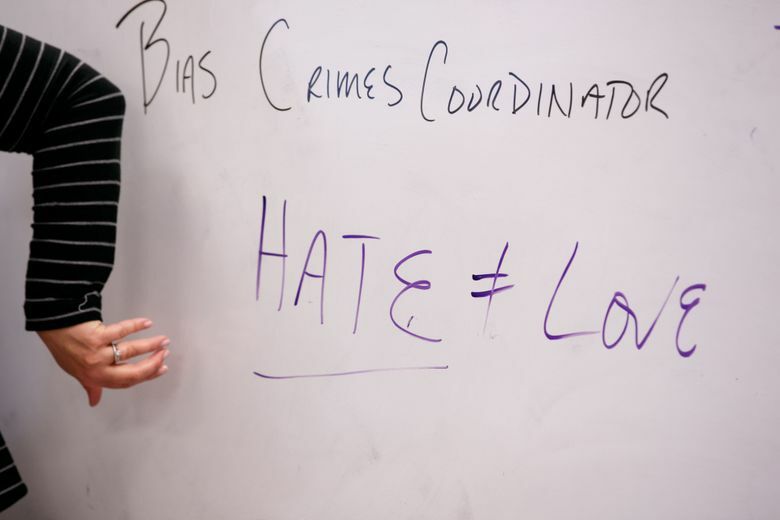 With reports of hate crimes rising nationally, police and prosecutors are making a concerted effort to reach out to communities they’re concerned could be targeted. 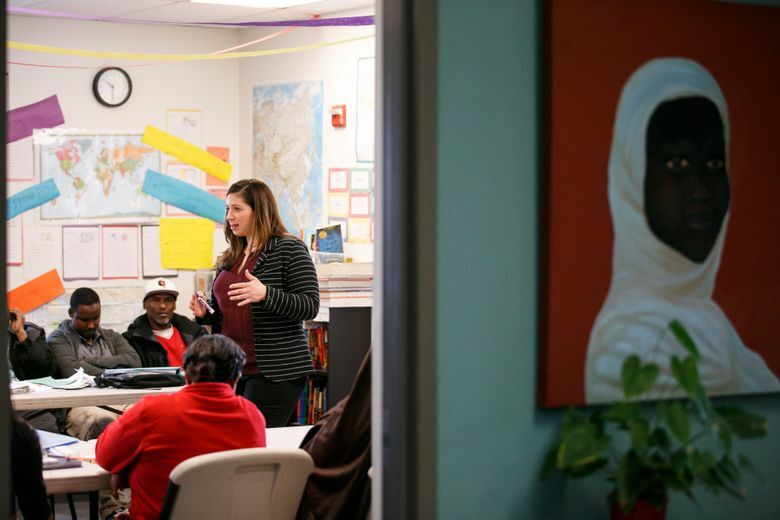 In a classroom spotted with colorful hijabs, Seattle police Detective Beth Wareing stands in front of whiteboard and asks the group of 25 refugees what the police were like in the countries they emigrated from. “From what I’ve heard, police are not the people you call for help,” she says. 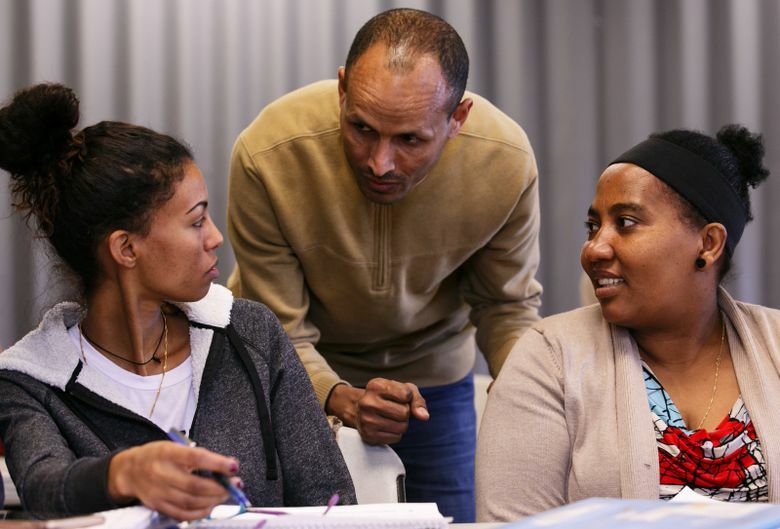 As case managers translate, bits of chatter erupt in Somali, or Ethiopia’s Amharic and Eritrea’s Tigrinya. Under Washington state law, the malicious harassment — or hate crime — statute provides protections for people attacked over race, color, religion, ancestry, national origin, gender, sexual orientation or mental, physical or sensory handicap. Here’s an explanation of what "bias crime" actually means. Karin Kaups, a teacher at the Refugee Women’s Alliance, asks the adult students for one word to describe police. “Scary,” says one student, in English. Some are good, some are bad, another man explains. The police are on your side here, Wareing tells the class. She explains how to call 911, what to tell dispatchers and how they should expect police to treat them (“professionally”). It’s a prelude to her message as Seattle Police Department’s (SPD) bias-crime coordinator. She wants to talk to them about hate. “If you’re targeted by someone who hates … I want you to call 911 and report it,” she says. It’s a heartfelt but pointed message. Reports of hate crimes are rising nationwide. 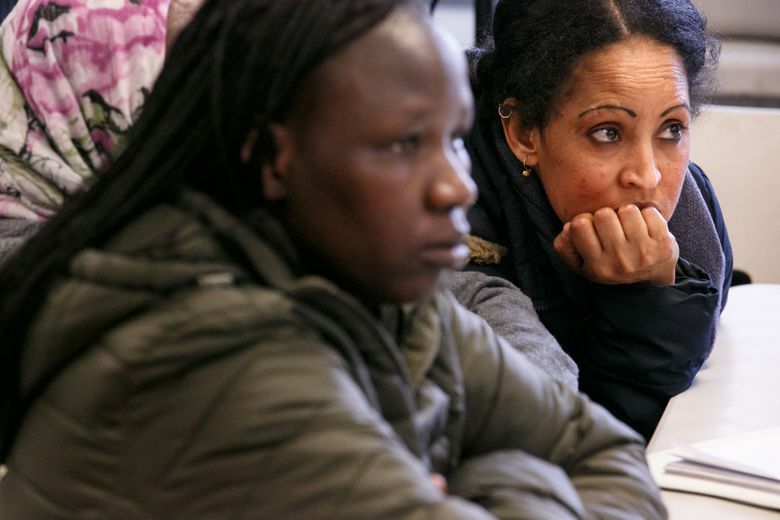 Some worry national political rhetoric and anti-immigrant sentiment could add fuel. Seattle, with its broad-ranging hate-crime laws and specialized police and prosecutors, is well-positioned to be a bulwark against hate. Some consider it the model. “I wish … every major metropolitan area was like Seattle in terms of coverage of their statutes, the structure in which they prosecute hate crimes. It tends to be, with some bumps in the road, a progressive community that takes these crimes seriously,” said Brian Levin, a professor of criminal justice at California State University San Bernardino who studies hate crime. “Seattle reports more hate crimes than the state of Florida. What that tells you is Seattle is doing a good job,” he said. In fact, Seattle reported more hate crimes than 33 states in the U.S. (including Florida), according to 2015 FBI statistics. In Seattle a misdemeanor malicious-harassment law extends those protections to include gender identity, homelessness, marital status, political ideology, age and parental status. Wareing tracks malicious-harassment crimes that involve bias and incidents that involve bias but aren’t criminal. Reports of the three categories combined have risen in Seattle from 113 in 2012 to 255 last year, according to SPD figures. Perhaps counterintuitively, Wareing would like to see that trend continue. 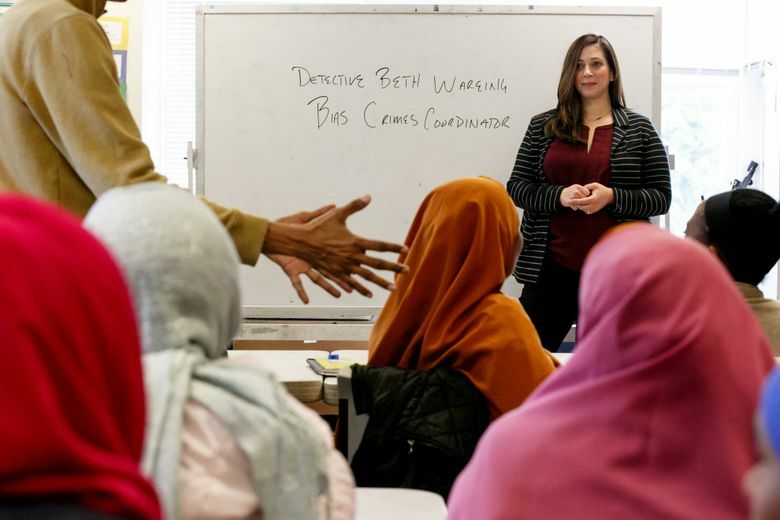 The recent stories of Seattle bias incidents range from bomb threats to anti-Semitic vandalism to encounters with ranting, hateful strangers near a Metro bus stop. Most often, hate crimes are “stranger-on-stranger” acts “intended to humiliate people” and symbolically threaten entire communities, Wareing said. Deputy King County Prosecutor Mike Hogan, who typically handles about 30-40 hate-crime cases each year, said about half of those involve mentally ill suspects. The other half are drunken bullies, he said. 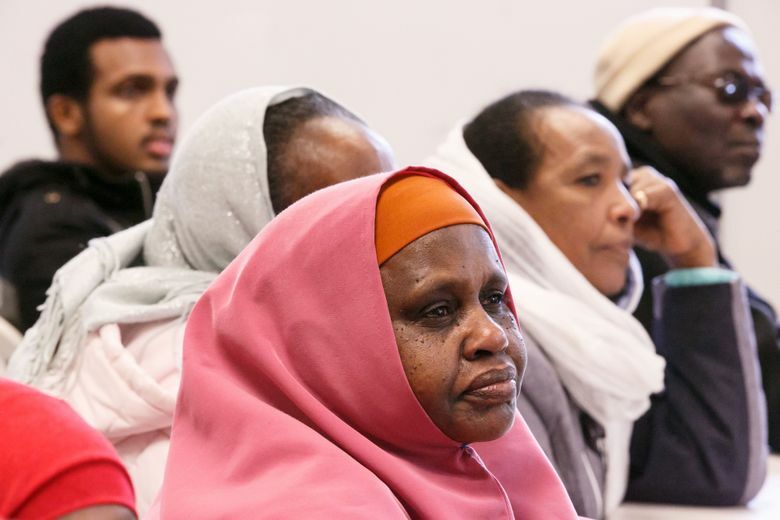 Any expression of bigotry — regardless of violent intent — can reverberate in communities. In June last year, Bobby Farris, 37, posted threats on Facbeook against Muslims, including “the final crusade against islam,” as well as a photo of North Seattle’s Idris Mosque with a comment about “too many targets to count,” according to charging documents. Farris was arrested after a brief standoff. “We had at least a 50 percent drop in attendance,” said Hisham Farajallah, a spokesman for the mosque. Last month, Farris pleaded guilty to attempted malicious harassment. In pleading documents, Farris admitted he “was highly intoxicated and depressed” when he posted his threats, but said he did not have weapons or intend to harm anyone. A felony charge was reduced to a gross misdemeanor so Farris could participate in Mental Health Court, a therapeutic court open to defendants with qualifying mental-health conditions. 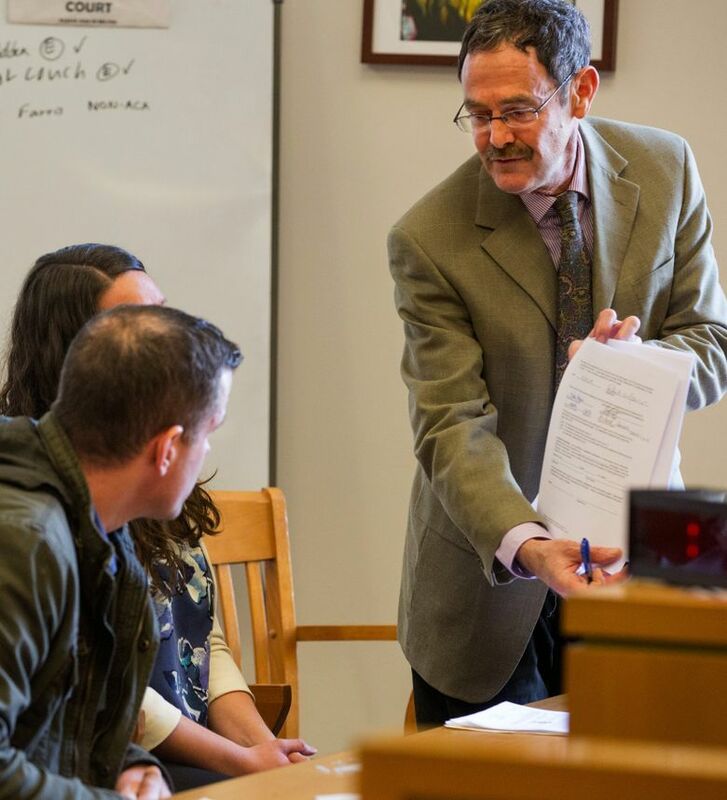 The program allows defendants to avoid jail time but meet frequently with the court and connect them with support resources, like housing and counseling. Farris, who has a history of alcohol, marijuana and cocaine use according to a treatment plan, must comply with strict program requirements. The mosque approved of the rehabilitation attempt. Attendance is back to normal at the mosque, Farajallah said. Cards and flowers with messages of support from the community grace its walls inside. In Seattle, officers are trained to listen for indications a crime might be motivated by bias, Wareing said. Any case flagged as a possible bias incident ends up on Wareing’s desk for review. Some aren’t crimes. Speech, even nasty, is free. Crimes are then assessed for their “solvability,” Wareing said. Some investigations take a gentle touch. Victims accosted by strangers are often stunned. Cultural sensitivities are numerous. Colleagues say Wareing’s smart to focus on outreach. Wareing joined the Lynnwood Police Department after college in 1997 during a “tough-on-crime phase” for policing, as she described it, and at a time with few women in the office and at least one male “old-timer” who wouldn’t go on a call with Wareing because of her gender. At 26, she became a detective who investigated everything, including homicides. Her strength is as a listener and communicator, she said. In 2009, she earned a master’s degree in counseling (“the best training I ever got to be a police officer”) and worked part-time as a mental-health counselor on weekends before coming to SPD. She continues to staff a hotline for first responders in crisis. “We all have stereotyped views of what police officers are. Then you meet her. Empathetic, smart, who just gets people,” said Bruce Miyake, assistant U.S. attorney for civil rights. Miyake and Hogan are seasoned prosecutors. Hogan, who has been with the county for 33 years, has handled malicious-harassment crimes since the 1980s, a decade in which he was “harassed for being gay on Capitol Hill on a couple occasions,” he said. Hogan was part of an effort then to add lesbians and gays to groups protected by the state’s hate-crime statute. He primarily prosecutes threats, he said, and most people plead guilty. Meanwhile, Miyake and the federal government proactively look for hate-crime cases in which it has jurisdiction. In some cases, federal prosecution could result in longer supervision for offenders. Fear of federal prosecution can be a tool for Hogan in plea negotiations. It’s not clear what role national politics plays in rising hate crime. “My concern is that there is permission for some people to speak out in a bigoted way,” he said. “When you have leaders spewing bigotry … it’s sometimes the followers who aren’t all there” who feel emboldened, he said. High-profile convictions can spur reporting, Hogan said. He hopes to see gains in reporting from Latino and immigrant communities after negotiating a guilty plea in the case of Sandra Jametski, who railed against “Spanish privilege,” questioned a woman’s immigration status and threatened to ram her car — all in a Facebook Live video. Fear of deportation should not be a barrier, he said, adding that it’s possible to get visas for crime victims. Hogan said he’s been reminding concerned groups that hate-crime prosecution is primarily a local issue.